Spring is One Of My Favorite Times of the Year! The Weather (should be!) Getting warmer and The Sun starts to Shine! 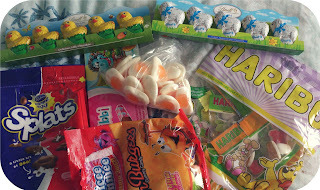 And of course, Spring also brings us Easter- a sweet holiday when we can all stuff our faces with endless amounts of chocolate and not feel guilty about it! I Love Easter and there will certainly be no lack of Chocolates and Treats in My House - But it just isnt the same if it isnt HomeMade! 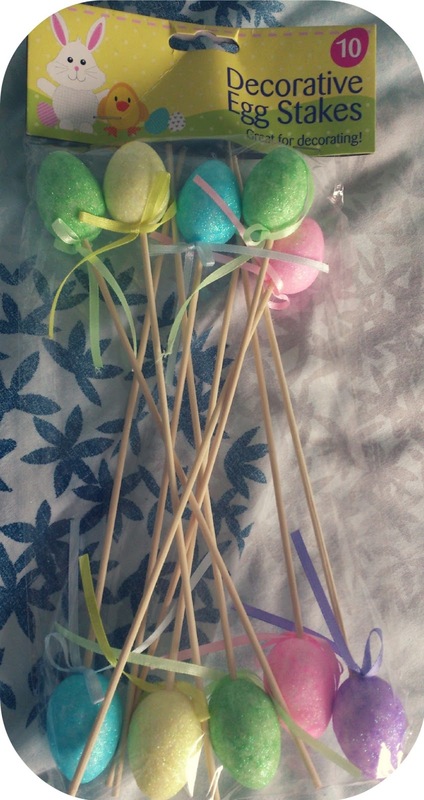 These Are Some Super Cute Egg Decorations I picked up from the £1 Store Nearby, I thought they would make a Lovely centerpiece or Perhaps be good additions to my cupcake stand, which will undoubtedly be making an appearance over Easter (: They are lovely and Sparkly and have sweet little bows attached and at just 10p each I'm sure they will be admired by everyone! I also Picked up these apt Cookie Cutters from the £1 Store! 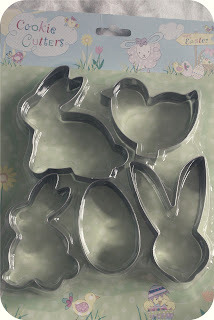 Although I have not used them yet I just know that they will make perfect treats for our family over Easter once decorated with unique iced Pastel patterns, wrapped in cellophane bags and decorated with some pretty ribbon! I Found this little Beauty at a local Warehouse type store Nearby, and for just £1.50 each, I had to get a few! 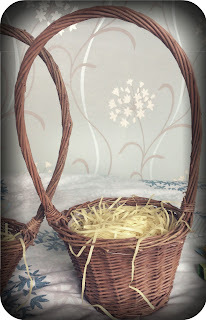 I Bought the Paper Tassels seperatley at the £1 Store (there was a lot in one bag so I used it to fill 2 of the baskets - Bargain! ), and once put together they Look so wonderfully easter-y! There's no doubt that they will be even more popular once filled with mounds and mounds of sweets and chocolates! 'So, What am I going to fill the Baskets With?!' I asked myself, and after a little more browsing at the Warehouse store, I found this little Handful!! Costing Just £4.50 for the lot I was so pleased! There is a lovely variety & I can Use this to fill a good couple of my Baskets (: I Found the Little Lindt Chicks & Bunnys a real treat as I know that these can usually be pretty expensive, but I Picked them up for just £1 per stick, they will make a special adornment in my baskets (: Is there nothing this store doesn't sell?! I also wanted to make something more personal to put into the baskets, and after some browsing on 'Pinterest', I found a wonderful little idea that I just had to try! 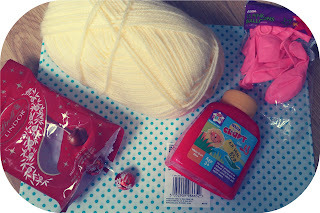 All I needed were these few items (costing just £4 at the warehouse store AGAIN!) which will make endless amounts of the end result! All I had to do was Place a few of the little lindt balls into the (un-blown up) balloons, then blow them up slightly until they resemble an egg shape. Next was the fun part! 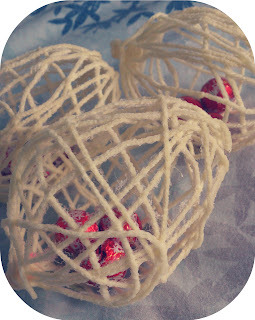 I watered down the craft glue a little in a bowl and dunked some of the wool into it, and then simply wrapped the wool around the balloon (making sure none of the gaps are big enough for the chocoaltes to fall out of!). The 'eggs' then need a few hours to dry, so I pegged them up on the washing line with some newspaper underneath to catch any glue drips! && below is the end result! A wonderful little unique treat which will leave smiles on many faces and the question 'how did you get the chocolate in there' on many lips!